The highly-anticipated New York primaries are finally here, and voters came out to cast their ballots. The state is the home turf of three of the presidential candidates. New York native, businessman, and GOP frontrunner Donald Trump is trying to claim New York, as are former New York Sen. Hillary Clinton and Brooklyn native Bernie Sanders. Among voters who showed up to the polls on April 19 is Clinton's daughter. Chelsea Clinton shared the big day with her daughter Charlotte — and the rest of us — on Twitter. Clinton posted a photo on Twitter of her one-year-old with an "I voted" sticker on her hand, referring to Charlotte as her "helper" and calling on New York voters to make their way to the polls, since they had just a few hours left to vote. It's safe to say that we all know who Clinton cast her ballot for — and not just because she tweeted with the hashtag #ImWithHer. 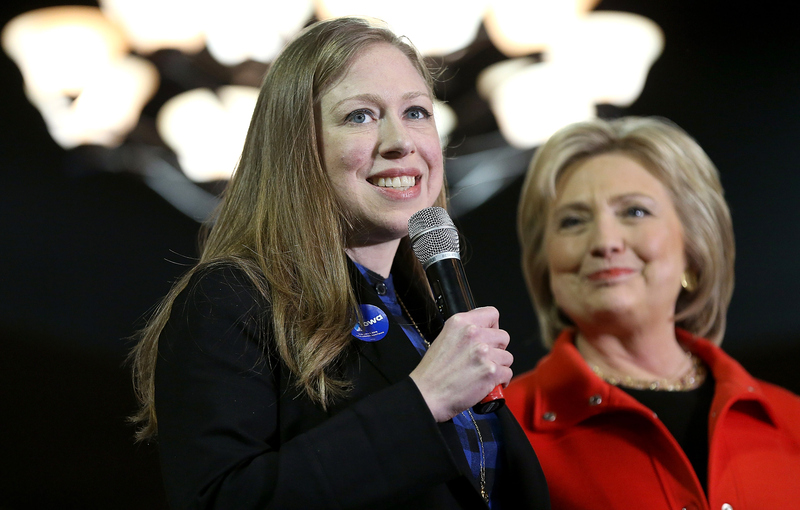 Chelsea has done quite a bit of campaigning for her mother's presidential run so far this election season, making appearances in New Hampshire, and has scheduled events in Connecticut, Pennsylvania, and D.C., among others. It's never too early to instill good voting habits in your child! In fact, teaching them about the political process is probably an important part of their growing up, as is understanding the electoral system in the U.S. and how the presidential nominating process works. Maybe Trump could learn a thing or two from Chelsea, especially because his own kids were unable to vote in Tuesday's primary, even while spearheading a campaign centered around the importance of voting. Ivanka Trump and her brother Eric Trump both forgot to register as Republicans ahead of the New York primary, and Ivanka has been the face of the "Get Out the Vote" campaign, posting videos ahead of other state primaries to remind voters of deadlines and registration procedures. Ahead of the primary results, Clinton had a significant lead over Sanders, with 53 percent of support to his 41 percent, though it's not unheard of for Sanders to make a comeback on voting day. Only time will tell, as the results come in on Tuesday evening. But Chelsea Clinton's cute pic has garnered support from plenty of Clinton fans.